Anyone in the art world can now get a special website address. Would it be useful for you? An artist I know was recently planning to launch a new website, but running into a lot of frustration with the URL she wanted to use. Her name is not unusual, and several other artists with the same name had already taken domains that she would have chosen if they were available. Her solution? Purchasing a domain with the ending .art, which served to help her distinguish herself as an artist immediately. In fact, she bought several versions of her name, her name and medium, and her name and studio with the .art ending, mostly to prevent others from purchasing them. In a world where it can be hard to be found, this new option may be an opportunity for artists to land the perfect site name for themselves. Art.art started offering the domain ending to early adopters in 2015, signing up museums, galleries, art organizations and even luxury brands as their customers. An .art ending identifies the website as art-related, much as the .org ending identifies a nonprofit organization, and can be helpful in online search results. The new .art domains became available to the general public in May, 2017, and have been popular since that time. A domain can be purchased from Art.art, or another site such as GoDaddy.com. Artists who already have a .com, .net or other domain and want to add .art as well can purchase the new domain name, and forward traffic to their existing website. 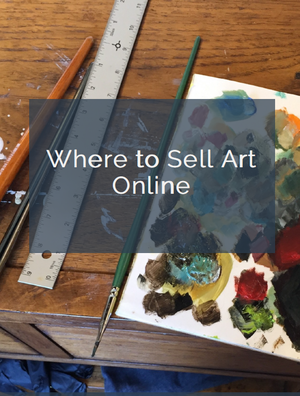 Would you consider purchasing an .art website address? I’m curious to know whether it is still recommended to go for that .com rather than the .art , if one can only afford one url. I have a.com url, but have known about the .art for, I think, a couple of years. As an individual artist, my only choice was to sign up through godaddy to be notified when the .art became available for open registration. As soon as the notification came through, I jumped on getting a .art. However, be forewarned, that it may be for you, as it was for me, that every url I wanted, including my name, was reserved and offered at exorbitant prices. I spent quite awhile while going through my sub-sub-sub lists, before signing up with an url which I may, or may not use. So, I am wondering if one has to choose an url that is way down one’s list, maybe the .com choice is preferable still to the .art? Time will tell whether the .art is better than .com for an artist. I suspect the url’s promotion and content will be the great equalizer, no matter the dot ending. But to be able to afford an url that has your name, or is short, easy to remember, and the least likely to be misspelled, wouldn’t hurt . Hi Christine, Actually the .art domain was only “invitational” until last month, when it opened to the general public. You ask a good question, because prices can be exhorbitant depending upon whether they are owned or not. But that is also the case with .com URLs. These days I think people are getting used to other endings, just because they are more common. My advice would be for an artist to consider the .art if they are locked out of getting a .com with their personal name, studio name, etc. – or just to have an extra domain name that points to their regular .com site. The artist I referred to in the article got her domain for $17.00. I have had my current website for a little over 10 years that includes my name with the .com extension. I was excited when I first heard about the .art extensions being released. I signed up 2 years through one of the registrars to be notified when the .art was released to the public, but apparently never got a notification as I am now just finding out through this post (Thank You Carolyn!) Anyways, I plan on getting one simply to have a shorter address for the general public to easily remember. But at this point, just using it as a redirect for printed promotional material. Sounds like a plan, Will. Clearly you will want to keep your existing domain that people know and visit, and use it as your online headquarters. However, with an ending like .art, it cannot hurt to have another URL pointing the way. If someone Googles “Will Esridge art” (the type of search I do all the time) you might want those exact words to lead to you, especially if you were not the only one with the name.